Istanbul and its wonderful warm, funny and loving relationship with free agent kitties. 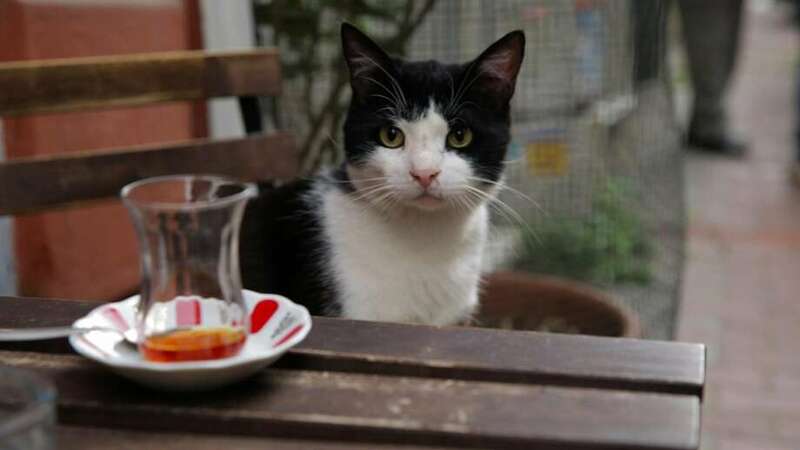 The people interviewed for "Kedi," Ceyda Torun's documentary about the teeming street cat population in Istanbul, are not experts, or talking heads, or academics. They are citizens, moving through their lives, interacting with the cats in their neighborhoods, and their comments are casually contemplative, off-the-cuff and profound. The human beings take it upon themselves to care for the cats, feed them, and—even more tellingly—just enjoy observing them. They note each cat's personality quirks, likes and dislikes. They freely admit what these cats bring to their own lives. I am a cat owner, I admit, but even I was surprised at the power of "Kedi." Where did all that emotion come from? It's because what Torun really captures in her unexpectedly powerful film is kindness in its purest form. The cats of Istanbul are everywhere. They curl up on stoops, car hoods, and cafe benches, they sit on piers and in doorways. They sneak beneath tables at flea markets and leap on scraps outside the fish markets. Torun's film profiles seven individual cats, each with its own distinct life, routine and personality. Considering the sneaky crepuscular habits of cats, following these beasts must have been quite a feat. The footage is astonishing. The film opens with a tabby cat stalking with purpose down a crowded city street, looking for food to bring back to her litter of kittens (stashed in a stairwell). Torun's camera is low to the ground, on the cat's level, following the tabby's determined progress. Watching "Kedi" is like lying down on a quickly-moving skateboard. Cats are wily creatures, and when they don't want to be found, they are not found. But Torun finds them! There's one cat who hangs out at a restaurant by the water, taking care of the mice. (There's a hilarious night-vision section showing the cat creeping through a drain pipe, eyes ablaze.) There's a cat who dominates the area in front of a busy cafe, fighting off interlopers, harassing her "husband" (pushing him out of the way so she can eat first), and chasing off the floozy cats vying for her man's attention. ("She's the neighborhood psychopath," says a neighborhood resident.) One woman spends a day cooking fresh chicken and then wanders her neighborhood, leaving food for the cats, who swarm around her. She says that she has a lot of pain and the cats are helping her heal. There's one cat who sits outside a bakery, and bats on the windows frantically when it gets hungry. There's a freeform style of communication between cats and humans. They share space. Some cats adore being petted. Others can't abide it. A man who owns a textile store demonstrates that the cat who hangs out in his shop likes pats only when they're rough. Gentle pats drive her crazy. "She gets so much pleasure she almost passes out," he says, and then there's footage of her sprawled on the floor, lost in the sensations. One cat shows up at a woman's window every day for a visit. She lets him in, he strolls around, he eats, and then he clambers back down the tree. The focus is on the cats, but "Kedi" is really a portrait of community. Torun gives a sense of life in Istanbul, its diversity and beauty, its storefronts and waterfronts, its people. Why there are so many cats in Istanbul, and how they all came to be there, is not explained (except for a casual comment from an interview subject). Political upheaval and turmoil is not addressed at all, although there are disturbing signs everywhere, thrumming underneath the everyday routines. One woman says that it is very difficult to be a woman in Turkey, and that the cats in her neighborhood remind her of what is good in being feminine. There is a lot of concern expressed about the brutal knocking down of old neighborhoods to make way for high-rises. Gentrification disrupts entire ways of life, and the residents worry about that but they also worry about the cats. Where will they go? What will become of them? It can be a heartless world. Caring for one another and caring for animals may seem like a small thing, but Torun's affectionate portrait of these cats—and the people who love them—makes it seem like the most important thing in the world. A restaurant owner keeps a tip jar on the counter, and the money goes into a fund for vet visits for the cats who hang around outside. Imagine that. Torun combines her up-close-and-personal footage of the cats with transcendent drone shots of Istanbul in all its moods and weather. What is the fascination with cats? I wonder if it's because cats carry an inherent distance from us within them. They are not balls of unconditional love like dogs. They seem serious and dignified. They withhold themselves. They don't trust right away. Maybe it's that withholding aura that makes people draw closer. Maybe it's because cats don't wear their Need on their sleeves, like dogs do. If a cat trusts you enough to show you its belly for a pat, you know you've done something right. If a cat shows up one day for food, that's random. If it returns the next day? The cat has chosen you. The residents of Istanbul interviewed in "Kedi" know this, and feel blessed by it. 18th century English poet Christopher Smart's most famous poem "Jubilate Agno" was written during his time (1759-63) locked up in the lunatic asylum St. Luke's Hospital for religious mania. One section of the poem is a long "consideration" of his cat Joffrey. The poem is beloved of cat owners for its insightful observations on cat behavior, but also for its pure appreciation of Joffrey's cat-ness, Joffrey's "self," his cat needs and ways. I thought of it often as I watched the incredible footage of "Kedi," a film that shares Smart's wonder, fascination, and love.